Rosy Rings Red Currant & Cranberry 3 Wick Botanical Brick Candle is the perfect home fragrance for the holiday season and all through the winter months. With its festive blend of Red Currant, Black Currant Leaves, Tart Cranberry, Plum, Spicy Rose, Red Clove, Cinnamon Bark & Nutmeg, Rosy Rings Red Currant & Cranberry 3 Wick Botanical Brick Candle has a festive fragrance. 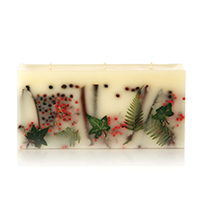 Encased within the wax are Birch Twigs, Feather Ferns, Hawthorn Berries, Ivy Leaves, Pepperberries, Rosehips & Star Anise. As the candle burns down the middle, the encased botanicals are gorgeously illuminated. For a stunning display add the Rosy Rings Hammered Rose Gold Tray. The Rosy Rings Hammered Rose Gold Tray is a gorgeous tray that is designed to for Rosy Rings 3-Wick Brick Botanical Scented Candles. It has a hammered texture and finished in rose gold color. A beautiful way to display you Rosy Rings Botanical Brick Candle.